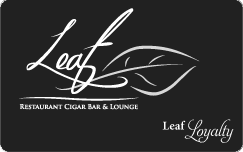 Earn rewards with the Leaf Loyalty card! Don’t miss out! If you’re not yet signed up, ask your server today. Rewards members, check your points online below!